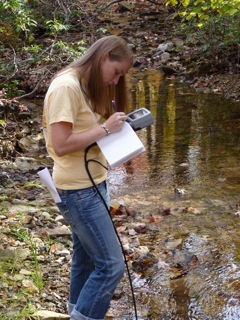 Bucknell student Joanna Freeman ('12) measures water quality in small stream at Roaring Creek watershed, a forested watershed that has been instrumented by the Susquehanna River Initiative faculty and staff for teaching and research purposes. • A team of over 25 faculty and 50 students collaborating on teaching, research, and outreach endeavors in the Susquehanna watershed. • Revamp existing courses or develop entirely new courses that incorporate the local Susquehanna watershed as a context for learning. • Collaborate on research in the watershed, including air, water, and soil/rocks.